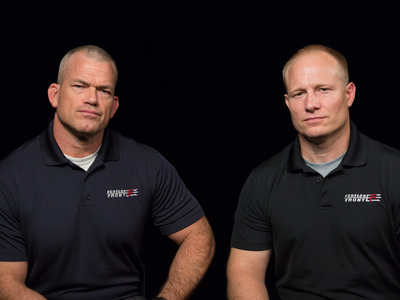 Business Insider/Jessica TylerJocko Willink and Leif Babin are former Navy SEAL commanders who founded Echelon Front. Their leadership consulting firm, Echelon Front, has worked with more than 400 businesses since its founding in 2010. They teach being “Default: Aggressive,” which means being proactive rather than passive or reliant on others. It does not mean being reckless or aggressive toward other people. In the book, Willink describes Default: Aggressive as aggressively working to “overcome obstacles, capitalise on immediate opportunities, accomplish the mission, and win” without needing every decision explicitly approved and without turning down an opportunity because it falls outside their job description. “‘Aggressive’ means proactive,” in this case, Willink wrote. “It doesn’t mean that leaders can get angry, lose their temper, or be aggressive toward their people.” It also doesn’t mean being reckless. Willink wrote about a time when he worked with the CEO of a growing small business whose confident, headstrong attitude was contagious. It was so contagious even Willink got caught up in her enthusiasm for ambitious growth plans built on stretch goals that would put a serious strain on the budget. He explained that while he admired her embrace of the Default: Aggressive mindset, its purpose is tied to the good of the team. If confident, proactive behaviour is actually placing the team in unnecessary danger, it’s not worth the risk.